Cupcakes are a favorite sweet treat of mine, but I’ve often shied away from making them because all of my recipes yield at least a dozen little cakes, if not more. I’d find myself purchasing the bakery cupcakes from the grocery store and cringing when I looked at the ingredient list (partially hydrogenated shortening, anyone?). I also developed an unhealthy obsession with the frosting; when I started buying these cakes just to lick the frosting off and discard the cake, I knew I had a problem. Convinced the frosting was loaded with crack, I went cold turkey and started playing around with my own recipes until I found the combination that yielded a light, fluffy, and moist cake, with a smooth buttery icing. Preheat oven to 350*F. Line the middle two rows of a muffin pan with cupcake papers (six total). In a large mixing bowl, combine the flour, sugar, baking powder, and salt. Mix for a second or two to thoroughly combine the dry ingredients. Add the stick of butter and half of the milk. Mix on medium-high speed for two minutes; the batter will be very fluffy. Scrape down the sides of the bowl with a spatula. Add the egg whites and vanilla to the remaining milk and whisk to combine. With the mixer on low, slowly pour the milk into the batter. Raise speed to medium and mix until just combined. Divide the cake batter among the six liners. Bake for 20-24 minutes or until an inserted toothpick comes out clean. Cool completely before frosting. With the mixer on medium, beat the butter until it is very soft. Turn the mixer on low and slowly add the powdered sugar, beat until well-bleneded (if using a stand mixer, use the paddle attachment). Add the vanilla and salt and beat until incorporated. If the frosting needs to be thinned, add milk in half teaspoon increments until a spreading consistency has been reached. If desired, tint with food coloring. Frost cupcakes and store in refrigerator. They should keep all week, resulting in a daily treat or dessert. *Take the butter out of the fridge about 30 minutes prior to making the frosting to be sure it’s the proper temperature – you don’t want the butter bordering on melting or the consistency of the frosting will be off. These look wonderful! I often wont make cupcakes alot of the time based on always having to make 12 or more..6 is perfect! Im going to bookmark this and make them soon! Love that this recipe only yields 6 cupcakes, that is perfect. Your frosting sounds as if u perfected it!! Looks so pretty, too! This look and sound wonderful. The small batch is a great idea!! Nicely done here. This is a good treat to enter the year 2010.
this is quite possibly the best white cake recipe i’ve ever tried! Sonya & Donna – just an fyi, if you want an even smaller batch, halving the recipe works out great. Jessica – I’m so glad you enjoyed them. Hi, was that just enough frosting for 6 cupcakes, or did you have some left? I have the worst luck making cakes from scratch. No matter what I try, my cakes always end up dry and dense… This recipe, however, was the best white cake I’ve ever made. So moist and delicious! I’m hoping to double-it (or probably triple it) to make an actual cake. Chrissy, I’m so glad you now have a recipe that works! I’ve successfully doubled this recipe, so you should be fine. This is a great recipe, especially when you don’t want all those leftover cupcakes. I used whole wheat pastry flour instead of the cake flour and the cupcakes turned out delicious. I also used Nutella for frosting. Cindy, I’m glad your substitutions worked out well. Thanks for sharing – a bet a lot of people would be interested in trying these with whole wheat pastry flour, myself included! These cupcakes turned out amazing! I have tried 4 other recipes for cupcakes and all of them have failed. I was extremely impressed with how light and fluffy these were! I ended up whipping the butter and sugar together before adding the milk and dry ingredients and it worked well! Thank you so much! I’m so glad you had a good experience with this recipe! I’ve felt your pain, however; I’ve tried many cupcake recipes I wasn’t happy with (generally, the cake was dry). I found when you’re not happy with how recipes turn out, start tinkering until you find the magic combination of ingredients and method. I tried this recipe last night, and the cupcakes were so good! I misunderstood the direction though, so I creamed the butter and 1/2 the milk together first, then add the other milk + egg white + extract mixture. Needless to say, it was very liquidty. I added the dry ingredients last, and the consistency was right. However, the cupcakes still came out very fluffy and moist, just exactly how I want cupcakes to be. I really want to understand why this recipe made such a difference in texture. I tried the basic vanilla cupcake at Joy of Baking using the creaming method. It smelled heavenly while baking but it was (much) denser. The differences in the two recipes (besides ratio) are flour (cake vs. AP) and eggs (egg whites vs. whole eggs). I understand the usage of cake flour and why, but why just egg whites? Why not whole eggs? What would happen to the cupcakes if I use whole eggs vs. just the egg whites? I don’t want to use whole eggs in next recipe as I could ruin the cupcakes that way, but I might have to just to satisfy my curiosity. Amy, I’ve long preferred using just egg whites in vanilla cupcakes. The whites easily incorporate air, producing volume, resulting in a very light and airy texture. The whites are mostly protein (with some water), so they provide structure, as well. The egg yolks provide additional fat, color, and moisture. The yolk also helps emulsify the fat and liquid, providing structure. In cupcakes/cake, I think they add some heft, so when I want a really fluffy cake, I don’t use them. Cake flour is a softer, lighter, lower protein flour with less gluten than all-purpose flour (measure out a cup of cake flour and a cup of all-purpose flour, then weigh them – cake flour weighs noticeably less). The butter also contributes to the recipe; it coats the gluten in the flour and shortens the gluten, which also helps create a very tender, moist cake (especially when you start with a flour with a lower amount of gluten). So, it’s really not about just one ingredient, but rather, how they all “play” together. I’m sure there’s more of a scientific explanation that a trained baker or pastry chef could give; as I’m neither, my explanation is strictly the result of years and years of baking, as well as reading up on the “why’s” when I could. what do you suggest so that I have two 8″ layers? Oh, these look delicious. I have a batch in the oven right now. With just me, my husband, and my kid, we don’t need a couple dozen cupcakes, however much we might want them. Robin, you’re going to need to multiply the ingredients by 4 to have enough batter for two 8 or 9 inch layers. I’d bake at the same temperature, and start testing for doneness around 25 minutes. Julia, that’s exactly why I am up with a recipe for 6 – I’ve even cut this in half before to get only 3 cupcakes! What can I say? I can’t be trusted around them. This recipe is amazing. I am definitely going to try to make 8″ layers. My husband was sick of eating chocolate stuff all the time and really appreciated the change. This was my first time trying cupcakes and these are going to be a regular at our house from now on. Thank you so much! I’m so glad you enjoyed the recipe. I don’t have cake flour, can i use regular all purpose flour? Can you add ingredients such as peanut butter, cocoa, etc. to change the flavor of the cake? Can you add ingredients such as peanut butter, cocoa, fresh fruit, etc. to change the flavor of the cake? How much 5 tablespoons in ml? I just made these and they turned out amazing! They were moist and oh so soft. I lessened the amount of sugar a little bit and added some cinnamon. Still tasted really good. Great recipe! I’m going to use this recipe everytime I make cupcakes from now on. I made cupcakes this afternoon and they came out great. Very soft, moist and got over in seconds! Thank you..
Hello I tried your recipe for the cupcakes and it came out perfect, I loved how soft and moist they were..now for the frosting I had the exact amount of ingredients and followed the directions exactly how u put them and my frosting was runny..it wasn’t thick enough to stay on the cupcakes it just ran off and it looked sandy instead of smooth..what did I do wrong. @f00d!3 – because with baking, halving doesn’t always work. Baking is scientific whereas cooking is not. If you half a recipe for something that is to be baked, you mess with the proportions, and when you do that, things can go wrong. As far as baking goes it’s always better to develop a recipe that’s proper for a smaller batch rather than just half a bigger batch. You’ll always have better results that way. How much does 5 tbsp weigh please.Thanks for the recipe..
Hi, do you use liquid or dry milk ? I am so grateful to have found your recipe. Perfect for a household of three! 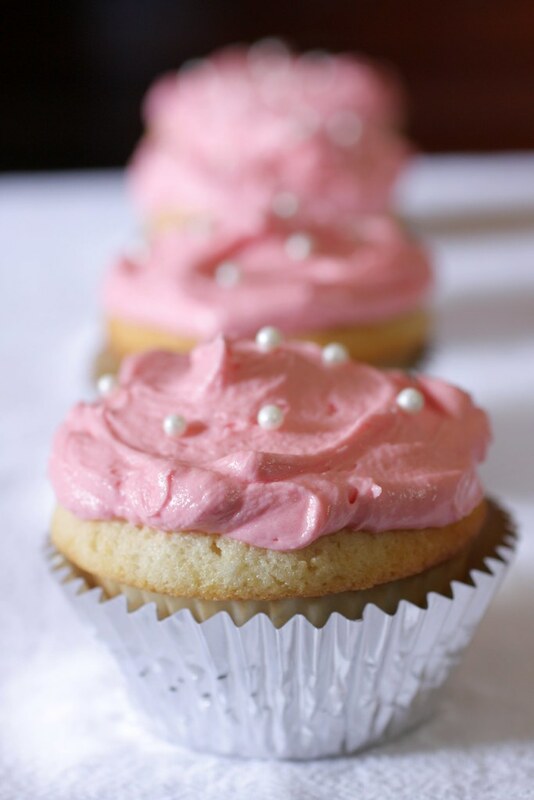 And the added benefit — these are the best scratch cupcakes to come out of my kitchen. I subbed vanilla bean paste for vanilla. I also wanted to use one stick and one stick only of butter, so pared your amounts to 4 1/2 tbsp for the cake and 3 1/2 tbsp for the icing. Finally, the pretty pink icing in your photo had me thinking of strawberries, so I whipped up some strawberry syrup and added two tbsp to the frosting, eliminating the need for milk. SUBLIME. Thank you! I just attempted this recipe. I decided to put the entire output in 6 cups- average sized cup cake tin. It completely overflowed and I now have a big mess in my oven. Tips on what I might have done wrong anyone? I ONLY wanted 6, but ended up with too much batter. Delicious! I am embarrassed to admit I have never made homemade cupcakes before my 7 yr old daughter was begging me to and we did not have a mix, thank goodness! These are just perfect and gone! We ate them up! Moist and flavorful. Used all-purpose flour and they were still great!